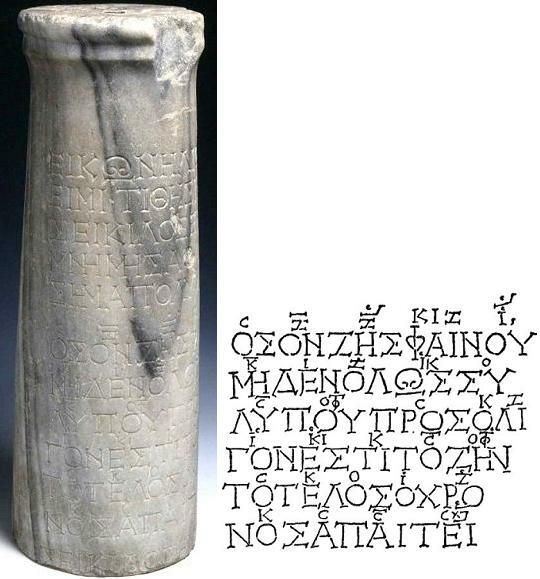 The "Seikilos Epitaph" is the oldest known complete song, found with lyrics and music notation carved on a tombstone in what is now Turkey. The tombstone and the significance of its inscription were first identified in 1883, and is now held at a museum in Denmark. The engraving and lyrics are in Ancient Greek, and probably date to the first century AD. The engraving says "from Seikilos to Euterpe" and it is thought to be from a man Seikilos to his wife Euterpe, which is why the song is known as the "Seikilos Epitaph". This engraving and other fragments suggest that the ancient Greeks had used a form of music notation since the 3rd or 4th centuries BC. We have not included the Greek lyrics in this example, but have shown two verses based on the song's melody. The first verse is played using a harp-like instrument, and the second verse is played on a recorder or flute-like instrument with the harp (or lyre) strumming chords as an accompaniment. Despite being 2000 years old, it is surprising how familiar this music seems. It uses a scale on A in the Mixolydian mode which was common in the musical theory of Ancient Greece. The music is available as PDF Sheet Music (using modern musical notation), a MIDI file and an MP3 file. If the music seems familiar to you then perhaps you have played the game "Minecraft Greek Mythology" whose composer Gareth Coker arranged this song to be sung by Aeralie Brighton.